Der Artikel Le mani sulla città (Hands over the City) (Blu-ray & DVD) (UK-Import) wurde in den Warenkorb gelegt. 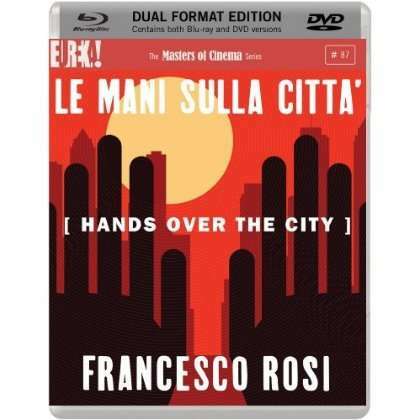 Winner of the Golden Lion at the Venice Film Festival, Francesco Rosi's Le mani sulla città [Hands Over the City] is one of the finest political dramas ever made – a ferocious, invigorating exploration of civic corruption in post-war Naples with the intensity of the best Hollywood thrillers. Beginning with the collapse of an apartment building in a working-class district, the film zeroes in on the subsequent investigation of responsibility surrounding the disaster. At the centre is Edoardo Nottola (Rod Steiger), a wealthy land developer and council member of the government's ruling party, who is determined to keep his personal and professional interests in the building of new government housing as intertwined as possible. With sterling performances and visual prowess, Rosi meticulously unpicks the tangled threads of interconnected favours and unscrupulous culture of self-reward within the halls of governmental power. This brilliant exposé (a major influence on countless filmmakers, including Coppola's Godfather films) remains as blazingly topical as the day of its premiere. The Masters of Cinema Series is proud to present this film for the first time on home viewing in the UK in a new Dual-Format (Blu-ray & DVD) edition.